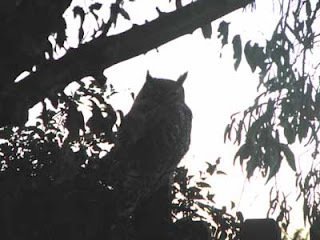 The evening after the Great Horned Owl surprised me in the early dawn, I encountered her again. She was sitting on top of the garage after sunset, when I went to put the chickens up (to keep them safe from the nocturnal visits of the weasel). I turned around and it was like seeing Santa Claus on top of the house, she was so imposing and so there. I quickly gathered up my little dog and confronted her. She stared down at me with those impossibly yellow, round eyes and listened intently to every word I said, imploring her to eat all the bunnies she wanted, but leave Zeke alone. And then she casually flew away, into the night. The next morning, there she sat on the fence, completely unperturbed as I strode out noisily, milk bucket in hand. I came to a short stop when I saw her unmistakable sillouette on the fence in the early twilight, did an about turn back into the house and grabbed the digital camera. I got off one shot when the camera informed me the batteries were low and it would be shutting down. Damn! Not a good time. I put the camera back in the house and came out again, fully expecting her to be gone. But no, there she sat, not ten feet from the animal shelters and milking shed. I went about my chores, talking to her, watching her as she watched me, with equal intensity. Finally, I asked her, "what is your name?" Immediately I heard, in my head, what sounded like "Henri....Hermano"; I questioned her again. "Hermione!" she exclaimed. And she turned her head to some distant unhearable fragment of sound, and floated off towards the setting moon on silent wings. She hasn't been back since. that I understand many Apso's possess. They have been the companions of the Tibetan Monks for centuries and have needed this gift of discernment in order to protect the monks from harm. And they have suffered much harm since the Chinese invaded Tibet in the 50's, destroyed many of the Tibetan temples, killed many monks and their little dogs and continue their oppression to this day. This race of wonderful little beings has only been saved because of caring people in the West who have rescued and preserved this breed with the cooperation of the Monks. 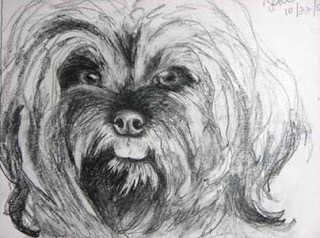 If you're interested in learning more, click on the FFT Lhasa Apso site on the sidebar. Theirs is a fascinating story with many heros. The quality of the light certainly does change when the Autumnal Equinox signals the end of summer and the beginning of fall. I plot the change of seasons by the course of the sun as he rises behind my neighbors house during the summer months. As soon as the Equinox passes, he comes up bright and cheerful just to the right of their house, in full, blinding view every morning as I go out to milk. And in the evening, he sets much closer to that little gap you see there in the back side of the Sandia Mountains. That's the view from the front side of our home, towards the west. That gap changes even as you drive away from our house; it only looks like that from my personal perspective. Life is constant change, constant motion. The only thing truly dependable in the entire universe is God. "I change not," He says. How comforting! A weasel killed one of our little hens two nights ago. At least it was a clean kill; she died quickly. This morning, before first light, I headed out to the chicken coop to see if the humane trap we had set the night before had captured the culprit. Six steps from the backdoor, I just had time to register the sillouette of a Great Horned Owl not four feet in front of me before she floated into the dawn on silent wings. They are bigger in person than they are on TV! Fully awake now, heart beating a little faster, I discover that our predator has weaseled out of the trap. In New Mexico Hispanic culture, owls are the omens of death. If she'd come the morning before, I'd have suspected she was there to announce the little hen's death. Now I wonder, are we in for it, again. Maybe it was just a post mortem. Ravens, too, have a mortuarial vocation. Just doin' their job. I remember this fellow from last winter, gathering at the remains of some unfortunate, suicidal bunny on the road. I keep it all in perspective by remembering that I just eat mine off a plate. God provides for me, just as He does the raven, the owl and the weasel. I love dogs. I don't just mean that I love dogs the way you love chocolate, I mean I love dogs more than I love a lot of humans in my life. And I love a lot of humans, too. But I consider dogs to be persons, in that I believe they have personalities, that they are sentient beings, an alien race, another tribe. And in stating that, I am saying that I believe that dogs have eternal spirits and souls, just like I believe that humans do. Only, they have no original sin, like we do. When Christ died to reconcile the cosmos with God, that "world" that God so loved that He died for included animate life. Creatures, all of them, now reconciled to God. Christ made up to animals what man had done to them. I believe that when animals die, their spirits, that eternal part of them, goes back to God, who gave it. Meditating on the Word has convinced me of this. I lost a very special love of mine last year. His name was Mychal Angelo. He died too soon, according to my plans, but right on time, according to God's economy. I miss him terribly. I'm going to paint a portrait of him, someday. Not quite right now, though. We share the air space around our home with a pair of large Chihuahuan ravens. They mate for life and claim a territory in which to raise their young. We have grown quite fond of the pair that occupy the area in our neighborhood, as we have watched their antics over the years. (They once dropped a golf ball into our yard--who knows where it came from!) We think they raised two young this year. The fledglings hang around through the fall, then fly off in search of other young ravens to hang out with through the winter. It's fun to see the large groups of raucous juveniles, numbering in the dozens, hanging out together. If they survive until spring, they charge out on their own, seeking a mate and claiming their own territory. My husband caught this shot earlier this summer. 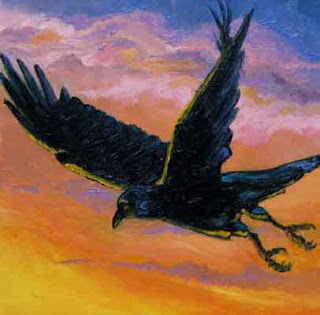 While I was washing my brushes in the sink just now, I noticed a raven in the same area of the sky as the one in the photo I just painted, catchin' the wind, doing his wing overs. They enjoy the wind a lot more than I do! Our first frost came a little early this year. It got the tomatoes, just like I suspected. But most of the hollihocks survived. 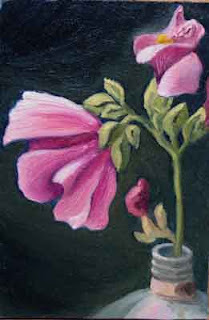 This year I had bright pinks, like this one, pale pinks, whites and even a few blacks (which are really amazingly deep purple). They really struggled because we got so little rain. But they are always cheerful and optimistic, no matter the weather. They bloom where they're planted and smile no matter what comes their way. I know a wonderful, older lady, like that. Whenever you ask her how she is doing, she always answers, "Fantastic!" And she means it, too. I know the hardships she has endured in her life, but to meet her and greet her, you wouldn't have a clue! Optimism and faith in the face of uncertainty; God grant us, one and all. Have you ever had the incredible experience of gathering up a freshly laid egg, still warm from its recent habitation within the body of a young hen? Have you ever gently sauteed a freshly laid egg in butter, anticipating the delicious, orange yellow yolk as it runs through the tines in your fork? Have you ever tasted the sunny freshness of a new egg? I hope so. 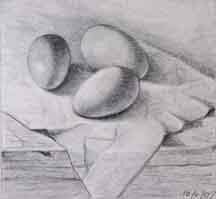 I give thanks to God and my young little hens for these, their first eggs. They are so proud of them! And I do, indeed, thank those little girls personally for each egg they so generously give us. Such gentle, loving creatures. Such incredible nutrition, packaged so expertly! 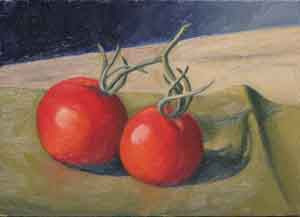 I've been struggling to grow tomatoes here in this high and dry desert climate for several years. Brandywines are the one and only variety recommended for our area by the local native plant nursery. After trying and failing with all the Early Girls and other commercial nursery varieties, I finally tried them this year. Had to grow them from seed. They're very round, truly red and made great salsa. Finally got lucky! Here's the last ripe pair from the garden. First frost will come any day. Finally got around to painting them, too. They were delish! I have lived in, and I now live within the shadow of the Manzano Mountains in Central New Mexico. There is an ancient apple orchard up there, in the village of Manzano, that is said to date to the 1500's, planted by the Spaniards or, more likely, the Franciscan friars that followed and "converted" the natives living there to their faith. The ruins of the Mission of Quarai in the nearby town of Punta de Aqua is as magnificent and imposing a cathedral as exists in any European city, and just as old. If you ever come to New Mexico, you must see it. I grew up in the midst of an ancient apple orchard in the village of Corrales. The trees were very old when I was a child there, in the 60's, and welcomed me with open, nurturing branches to climb them, which I did often and with great skill. They are mostly all gone, now. Several years ago I made a difficult decision to put aside fiber art and begin a new adventure in art. I completed divested myself of my hand dyed fabric business and life as a nationally recognized art quilter, and remodeled my dye studio into a painting studio. For three years, I took private lessons with a very gifted local teacher. His name is Chuck Dunbar, and he taught me what I wanted to know: how to construct a painting in the way of the old masters. 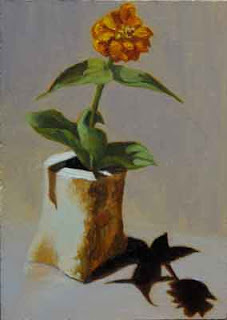 I've been painting in oils ever since, learning my craft. This year, however, the fiber art has come back around again. I haven't made any new art quilts; don't even have my sewing machine out and my small studio seems to have shrunk even more. Barely have room for a still life set up, easel and table for my paints. But my work in fiber has gotten some long overdue recognition. 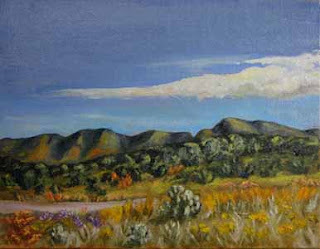 I was asked by the board of directors of the Albuquerque Fiber Arts Fiesta to be their featured artist this year. In May, I exhibited more than a dozen of my art quilts at the Fiesta and received some wonderful write-ups and publicity, and many kudos from the art quilt community and friends I hadn't seen in a while. As a result of that show, some of the ladies from my church asked me if I'd do a presentation for them. This past Saturday at a tea hosted by our church for a sister church in a nearby town, I was able to show even more of my quilts that haven't been seen in a while, and give a heart-felt talk to the women present. I used as my starting off point the first post on this blog, "How Can I Sing the Lord's Song in a Strange Land." And today I received in the mail several copies of the upcoming issue of Quilter's Newsletter Magazine (Nov 2007). On page 34 is featured some of the quilts of the recently ended national tour that began in 2001! called "Potluck", including my piece, "Cole Slaw." Here's a photo of it. It was nice to see it, and touch it again. I had hurried to meet the deadline back in '01 and send it on it's way to the opening of the tour in Boulder, CO. 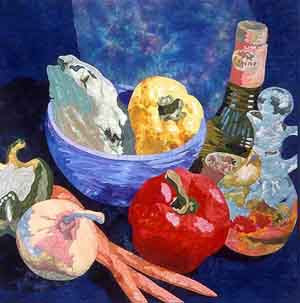 It reminds me exactly of why I wanted to paint in oils! All those tiny little bits of fabric, cut out just so, glued down and then quilted! Now I do the same thing with a flick of a paint-filled brush!